The hedge was way too high to see over. All we knew was that a blue tower had been constructed at the center of the maze. Gary and I and another couple were attempting to find our way through a hedge maze modeled after the Hampton Court Palace maze in England. It reminded me of the books of mazes that I loved to work through as a child. Hampton Court Palace contains the most famous maze in the world. It was commissioned around 1700 by King William III, covers a third of an acre, and is referred to as a multicoursal or puzzle maze. A multicoursal maze has many twists, turns, branches, and dead ends, delighting as well as frustrating visitors, who easily become confused, disoriented, and lost. By contrast, other mazes are unicoursal, which means that there is a only single path which winds to a center point. We usually call these mazes labyrinths. Cultures and civilizations from all over the world have built mazes and labyrinths for centuries. They have been discovered in petroglyphs, ceramics, clay tablets, mosaics, manuscripts, baskets, stone patterns, turf, hedges, and cathedral walls and floors. For some people mazes and labyrinths were a spiritual experience, while for others it was simply an intriguing and entertaining adventure. As the four of us entered the maze without a map we thought we’d walk to the center and back out in 10 minutes. Silly us. In theory we knew where the blue tower was at the center of the maze. However, the hedge was so high that we couldn’t usually see it. And even if we did, we always had a choice of 2 or 3 different paths. We’d try one path, which would lead to a dead end, then trek back and try a different path. When we arrived at an intersection, we would often disagree on which way to go, who should lead, and who had the best sense of direction. Because of the hedges we had no idea where we were and no way to orient ourselves to direction. It was like wandering in the wilderness or in the middle of a forest with no compass or sun as a guide. We became so confused that the 4 of us decided to divide and conquer. If 2 of us found the right path, we’d call out for the others to join us. More than once we’d wander for 5 minutes, then meet from opposite directions, more lost than we were before. It was frustrating, challenging, and great fun! When it started to rain steadily, we decided to cheat a bit. We knew that others had found the blue tower in the center, so we yelled out for them to give us verbal directions. From high above they could see the big picture as well as our location because our lifted umbrellas were higher than the hedge. After 20 minutes of wandering in a relatively small area and a little bit of help, we finally made it to the center. From the top of the tower, we could clearly see the layout of the maze, so we assumed that getting out would be easier than getting in. Wrong! Once we re-entered the hedges, we again became disoriented, and the exit route we planned from the blue tower vanished. Finding our way out took just as long as getting in. Next to the hedge maze was a labyrinth. From ancient times the labyrinth has been associated with the legend of the Minotaur. The Minotaur was a monster, half-man and half-bull, who lived in the heart of a labyrinth on the island of Crete. According to the story, Theseus made his way to the center of the labyrinth, killed the Minotaur, and found his way out by following a thread that he had trailed behind him. In reality, the Minotaur’s home was not a maze but a labyrinth where someone could get very lost. A true labyrinth has only one path, twisty as it may be, with one entrance, one exit, and no choice about which way to turn. Both the labyrinth and the maze have spiritual significance. The Romans used the ancient labyrinth as a decorative floor pattern, and in medieval times, Christian artists made labyrinths of colored stone or tile in the floors of many cathedrals. The well preserved labyrinth in Chartres Cathedral in northern France is the pattern used by many labyrinths today. For Christians labyrinths are a symbol of the Way, the believer’s journey through life to the heart of God. Some medieval pilgrims would even travel the labyrinth on their knees as a gesture of prayer and humility. The faithful walked the labyrinth when observing significant rituals such as confirmation, baptism, the journey to Jerusalem during Lent, the vigil of Holy Week, or the Christian life in general. In recent years labyrinths have sprung up in many religious and secular settings as an aid to prayer, meditation, and contemplation. Labyrinths also appear in novels, short stories, movies, and TV shows. I have found labyrinths to be very meaningful. A slow walk through the labyrinth clears my mind and allows my heart to unfold into God’s presence because I don’t have to worry about making choices or getting lost. When I travel the labyrinth I am often wrestling with a difficult decision, and the walking allows me to listen to the still, small voice of God. I find my way to the center, rest in God’s gracious presence, then meander my way out, refreshed and more attentive to the divine in my everyday life. 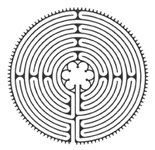 The labyrinth allows me to regain the serenity that is often elusive in the midst of the daily challenges of ministry. On the other hand, the maze more accurately depicts the reality of my life. There are no landmarks in a maze to guide and orient the wayfarer. Everything looks the same. In similar fashion, even though I proclaim Jesus as my Savior, the one who give direction to my values, mission, and faith, I often fumble around because I can’t always see the way clearly. The multicoursal nature of the maze necessitates constant vigilance and decision-making because there is more than one direction to choose. So in my own life I’ve discovered that God’s will is rarely crystal clear. And the older I get, the more uncertain I find myself, experience teaching me that there is not always one way that God intends for me to travel. Negotiating a maze alone can be a disconcerting experience. Even though our group of 4 disagreed good-heartedly, it would have taken us far longer to find the center if we had been on our own. Likewise, we need each other on life’s journey, for many are the paths that lead astray. “Bear one another’s burdens, and in this way you will fulfill the law of Christ,” says Paul in Galatians 6:2. Once we reach the “blue tower,” meet God, and regain perspective, we can’t rest on our laurels, for the path back into the world is just as treacherous. In the same way, once we become a disciple of Jesus Christ, life doesn’t get any easier, for now we are going against the grain of what the world values and expects. Jesus sends us right back into the world in service: chastened, humbled, and stripped of everything that formerly gave us identity and status. Both the labyrinth and the maze teach me when I embrace them and become one with them. So all that matters in my life is the journey. While a part of me admires those who are absolutely certain of the way as well as the destination, my path is often disquieting, agonizing, paradoxical, perplexing, and uncertain. When the hedges are so tall that I find myself lost, doubting, questioning, or even angry with God, I remind myself that what is most important in life is not where I travel or what I do but who I am on the path. God can and will use us wherever we travel if our hearts, minds, and spirits are open to surprise and the unexpected blessings of the Way. If we welcome grace, mercy, hope, and shalom to walk with us, we will eventually get to the center because wherever the blue tower is, that’s where we are meant to be – until our journey leads us right back into God’s world. Profound thoughts Laurie. We are on a journey that we would like to be straight and narrow leading to the “blue tower”, but it is anything but straight and narrow. I so often would like easy answers and easy directions in my faith journey. My GPS was supposed to help me and yet even that little device will lead me to a road that doesn’t exist. Thanks for the insights and the acknowledgement that we are still working things out as we travel the faith road. Mazes and labyrinths to me are frightening if there is no way to “cheat.” But if there is help from above (or people in a tower shouting instructions) it can be pure fun. I have had times in my life that I believe that I had help from above and my journey went satisfyingly well. What an interesting allegory you have presented, Laurie!! I was not aware of the historical significance of mazes and labyrinths in Christianity. Perhaps it is a labyrinth which is more attuned to Christianity which have only one correct unicoursal path? Or is a maze best defined – many paths, as long as you get to the center where God resides?